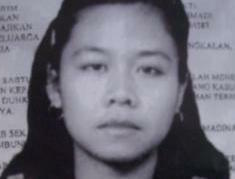 On this date in 1995, Filipina maid Flor Contemplacion was hanged for murder in Singapore. Contemplacion had, four years before, strangled a fellow-maid and drowned that maid’s four-year-old charge. That’s what she confessed to, at least. Even though Contemplacion’s camp would eventually argue that the confession had been coerced, or that she’d been possessed by a strange epileptic, Contemplacion herself never really walked back that admission. Still, Flor Contemplacion the cause celebre and Flor Contemplacion the cultural phenomenon was never only about the woman’s innocence, even if many do still believe she was framed. By whatever happenstance of timing and circumstance, widespread publicity of her case in the Philippines during the months leading up to her hanging tapped a national discontent among her countrymen and -women about “OFWs” — overseas Filipino workers. 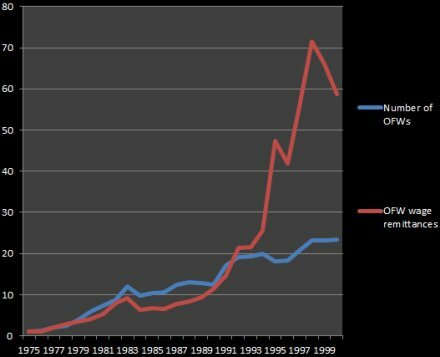 Boom of the overseas Filipino workers sector, 1975 – 2000 (1975 = 1). Source of figures; there are more official OFW stats here. To say nothing of the political discontents raised by such a discomfiting abdication of autarky, and the “domestic anxieties” (pdf) of developing “the embarrassing reputation that we are a country of DHs [domestic helpers], entertainers, and even prostitutes.” This is, truly, a rich and complex tapestry. Flor Contemplacion is practically the patron saint of the indicted Filipino/a abroad, and her fruitless clemency appeal the political breakout of OFWs and their allies as a constituency to reckon with. But as the story made headlines and some sketchy witnesses accused the victim’s widower husband of being the real perpetrator, the case became a national sensation. 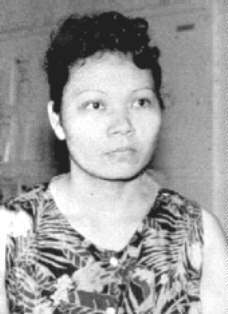 Recently-elected president Fidel Ramos, who campaigned on restoring the previously-abolished death penalty in the Philippines, not only had to put on the full-court press for this condemned woman but incongruously declared her a “national hero”; his wife personally received Contemplacion’s remains at the airport. Leaders and ordinary people from Catholics to Communists rallied (sometimes rioted) in anger. Whatever the domestic controversies, the labor-export business has only continued to grow in the generation since Contemplacion’s hanging. To this day, the Filipino public has shown great sympathy with OFWs entangled in alien criminal justice systems, and demanded diplomatic support — regardless of particular individuals’ putative guilt. Regrettably, it is often called to do so: from Saudi Arabia to China, the plight of Filipinos executed abroad remains a recurrent and emotionally charged theme in the country. Flor Contemplacion’s name, well-known still anywhere in the archipelago, was back in the news last year … when her three sons all drew lifetime prison sentences for drug-smuggling.